"End of Days is the explosive conclusion to Susan Ee's bestselling Penryn & the End of Days trilogy. When the angels release an apocalyptic nightmare onto humans, both sides are set on a path toward war. As unlikely alliances form and strategies shift, who will emerge victorious? Forced to pick sides in the fight for control of the earthly realm, Raffe and Penryn must choose: Their own kind, or each other?" I have waited for over a year for the third book in this addictive and explosive trilogy from Susan Ee. The first two books are incredible and so End of Days had a lot to live up to! There are two things that I love most about this trilogy. First...although each book leaves you desperate for more, there is no messing around at the beginning of the next book; we get to dive straight back into the storyline exactly where we left off. This is simply fabulous; there is not anything worse than being left on a complete cliffhanger (as the first book does, whereas the second book stops mid-flight, literally!) and then when you finally get your hands on the next instalment you find the author takes you around the houses for a few chapters to 'settle you back in'. Susan Ee glides straight back into the action and you instantly remember why you were so hooked in the first place. This also means that if you have not had yet had the pleasure of reading any of these books, then you can read all three and they will feel like one continuous story without having the tortuous wait that most fans have had to endure! The second thing I love about this trilogy is Raffe (not in that order, I definitely love Raffe the most)! 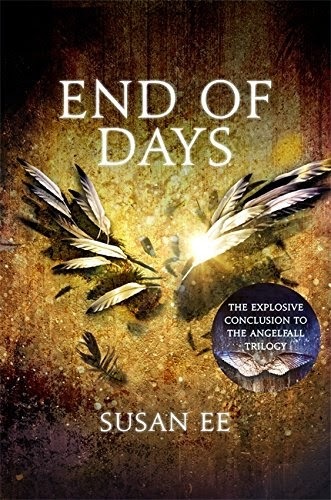 I adored the relationship and interaction that Penryn and Raffe have in the first book, which sadly you see less of in the second book but it is back with a vengeance at the start of End of Days as Penryn and Raffe are reunited. My absolute favourite parts of this book are Penryn and Raffe based - I don't want to give anything away but look out for Chapters 5 and 12 (I literally could not tear my eyes away from the page). If anything, I wish there had been more of these moments. The chapters in End of Days are short which means the pace is fast. Susan Ee has done a great job with continuity of all the threads into the last part of this trilogy. There continues to be plenty of action from humans, angels, demons and locusts! I read it easily in two sittings, and it would have been one had I had a choice! I felt like everything was wrapped up by the end (although felt perhaps a little rushed), however, my only complaint would be that when the end came, I found myself thinking "That cannot be it". There simply is not enough of the one thing all fans of this trilogy have been waiting for throughout the three books! I had longed for it for so long that I wanted to bask in it forever but it is all over so quickly. Then you turn the page and find an epilogue, and your heart skips a beat, but it does not really add anything in terms of closure! Perhaps Susan Ee will treat us with a surprise fourth book?!! Highly recommended as a trilogy; I just wish there had been more! The Penryn and the End of Days Trilogy is not just a young adult trilogy - it can be enjoyed by YA and adults alike (I can definitely not be classed as a YA anymore!). If you've enjoyed The Angel Trilogy by L.A. Weatherly, I recommend you check out this trilogy too! Angelfall, World After and End of Days are all OUT NOW! Get yourself copies of all three, block out some space in your diary and enjoy the addictive ride!